The visionary artist Ariston Jacks creates a decisive swath through the art world with his multi-disciplinary practice. His work serves as social collage that combines ancient African, European and American social phenomena through 21st century sub-cultures. The early stages of his art practice developed in his hometown of Pine Bluff, AR. As the saying goes, “there is something in the water” in the Bluff City; be it nuclear residue from the local Military Arsenal (ex National nuclear weapons production plant) or divine light particles directly from God that enhance abilities and creative energies of those who grow up in that dwindling, yet magical place. In the year 2002, those light particles found their way into the creative process of Ariston’s work. He has had an innate kinship to the city of Baltimore since his first visit in 1999. Later relocating from Little Rock, AR he made Baltimore home along with his family in January 2015. His image conjuring hands are fueled by the wisdom of the ancestors who came before him. The likes of visual artists such as Hale Woodruff, John Howard, Jeff Donaldson, and Ernest Davidson have lived, and worked in his birthplace partaking of that same water that Jacks’ drank growing up. Groundbreaking musicians such as Sun Ra and James Brown traversed Pine Bluff’s streets and venues. They were all powerful modern masters; working ahead of their time as Afro-Futurists; precursors to the emerging movement. Ariston is a student of those who pushed beyond what was into something entirely new, creating a remixed yet futuristic African aesthetic here in America. His artwork actively seeks to answer questions while presenting visual narratives. Jacks’ work indirectly captures messages of resilience and latent magic energies of that spiritual ARK creating new sacred, layered, intricate messages for posterity. Jacks’ has traveled extensively to inform his cross-cultural aesthetic. Using painting, printmaking, and photography, he creates images that inform and inspire. His use of cultural icons, sacred geometry, and the mixing of luminescent powder with acrylic paint are where the uniqueness of his artwork rests. Conciliating darkness and light, "alter images" become visible when the work is viewed in dark. Jacks’ career spans more than fine art. After serving six years in the U.S. Navy, he completed a B.S. degree from the School of Arts and Sciences at the University of Arkansas at Pine Bluff where as a Freshman he designed the official sports logo still in use today. Later he earned a M.A. degree in studio painting from the University of Arkansas at Little Rock. Jacks’ has served as University faculty as well as Art Director for the Creative Expressions Program at the Arkansas State Hospital. This revolutionary Psychiatric Art Program he helped develop positively impacted the lives of Arkansans by empowering individuals living with mental illness through the visual arts. He has exhibited on a national and international level and was recently featured in PRIZM, Art Basel Miami 2016. 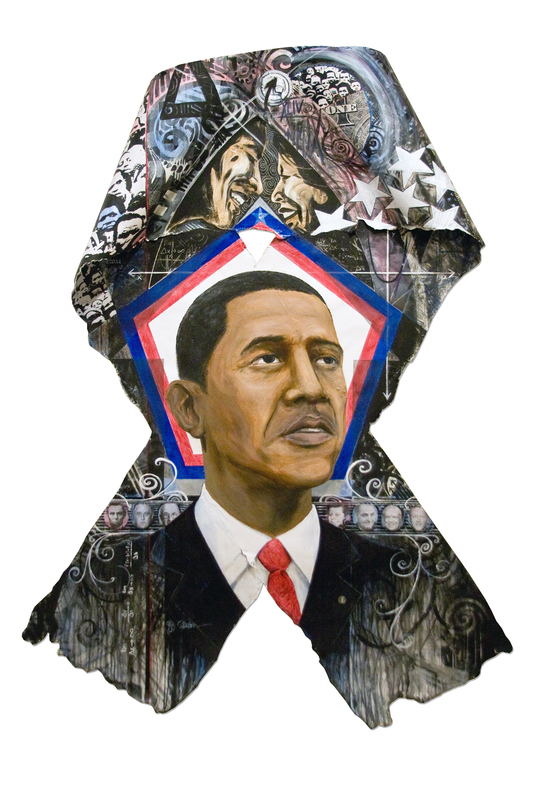 His works are included in numerous, public and private collections including the Mosaic Templar’s Museum, African American Museum of Dallas, Butler Center Collection, Johnson & Johnson, and Alcatel Lucent Corporation.